Hello and welcome to my May Favourites, this month I have twelve, yes that’s right, twelve things that I’ve been loving, bear with me, I’m going to try not to go into incredible detail about each! This month I tried out quite a lot of new beauty products, most of which I fell in love with. Aside from some beauty bits, there’s also accessories and some media too, so something for everyone. I hope you enjoy it! 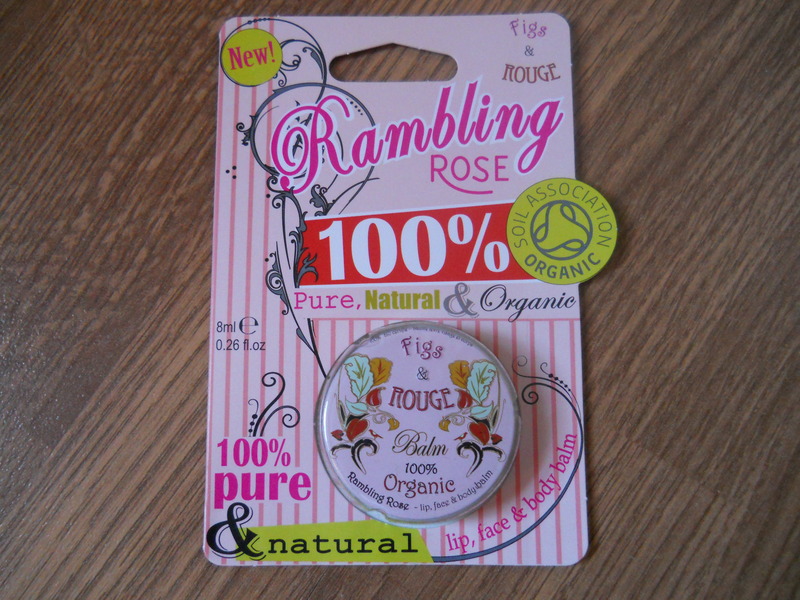 We’ll start off with number one which is the Figs & Rouge Rambling Rose lipbalm that came in my April Glossybox (click here to read my initial thoughts and contents post, and here to read my indepth review post). I loved it when I first put it on, and I still love it now and feel like it’s done wonders for my lips. I’ve been using it before I put on my make up to allow it to soak in before I put on lipstick/gloss etc. and I feel like it really has hydrated and stopped my lips peeling. My lips are now really smooth and soft which I think is down to the sugary texture when it is first applied. Even as a gloss this is really nice, it’s not the most long lasting, however it leaves your lips in great condition, and smells divine. I’m definitely repurchasing this. I believe it retails for £4.99 so it’s not going to break the bank either. 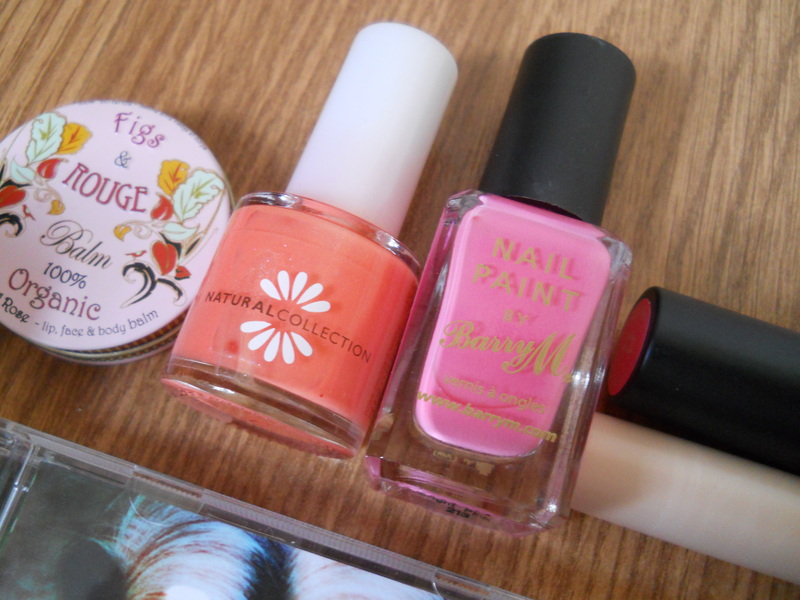 Number two is a nail polish from Boots’ Natural Collection in Antique Coral. 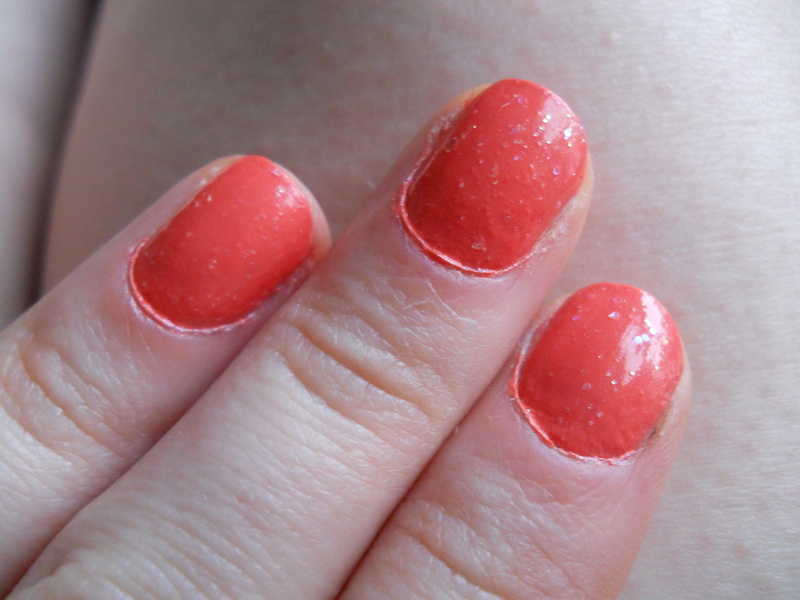 It’s a gorgeous vibrant coral with ever so subtle blue shimmer in it and at £1.89 it’s a complete steal. The formula isn’t the greatest as you do need patience to apply even coats, the polish is quite thick and opaque so you could see streaking if you don’t allow each layer to dry properly. It is so worth it though as the colour is absolutely gorgeous and when dry the nails are super shiny and last for a good 3-4 days. I applied a coat of Kiko’s Multicoloured Sequins over the top of my nails as a topcoat, but the nails are just as shiny without it. 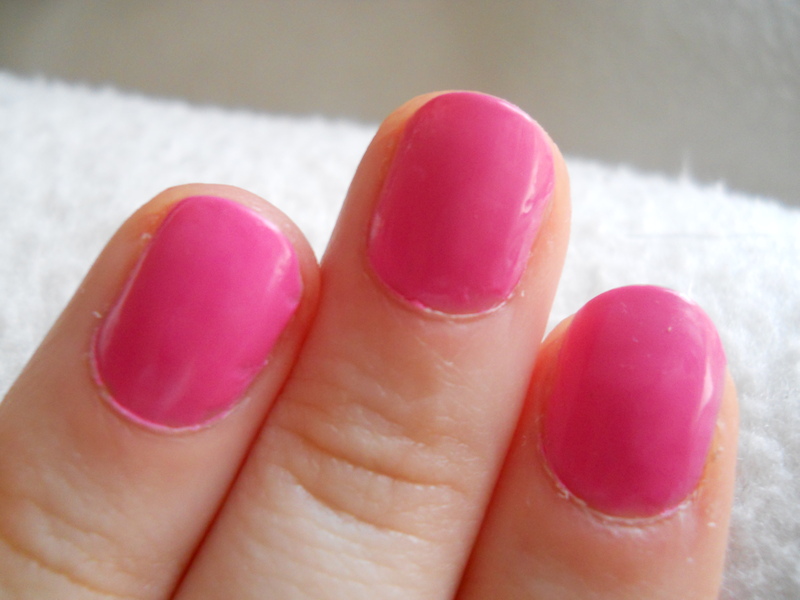 Next up number three is another nail polish, but this time it’s a Barry M polish in the shade Bright Pink. Although the name is less than inventive, this colour is so much fun. I love playing around with colour and going a bit Barbie with my nails sometimes, and this shade is perfect for that as it’s a true bubblegum pink. This shade also comes in a shatter effect polish and even after four days I saw absolutely no chipping whatsoever before I took this off. I don’t think you can go wrong with Barry M polishes as they’re widely available, are only £2.99 and are some of the best nail polish formulas out there. Next up number four was an impulse purchase I made while at Boots in Euston Station and trying to kill time. After swatching loads of lipsticks on my hand I actually came across this No. 17 Lasting Fix lipstick in Hawaii Pink and have worn it non stop since. Let me first say that for £4.29 this is an incredibly long lasting lipstick (as the name would suggest) and the colour is just so gorgeous. It’s somewhere between a bright pink and a coral which perfectly suits the name, but it’s also somewhere between a glossy lipstick and a matte. It’s not completely matte, but it gives that more modern edgy look as a matte lip does, just with a hint of shine to it. I’m a huge fan of matte lips and really hate shiny, shiny lipsticks so this for me is perfection. You may remember me sporting this in an OOTD this month, so I’ll insert that photo below, (click here for the full post). Number five is a product that’s had rave reviews all over beauty blogs and the world of Youtube lately, and it’s Collection 2000’s Lasting Perfection Concealer. I was using Collection 2000’s Illuminating Touch pen which I liked, but that wasn’t quite doing the job I needed it to. I decided to switch to this, and I’m glad to see that the rave reviews are right. The coverage is great, the colour range is good, I’m shade 1 Fair which is perfect for me, and it really does last until I remove my make up at night. A great, low cost concealer that does the trick at only £4.29, the only issue is that the text on the packaging rubs aways after mere days so you have to get used to having a completely clear tube. 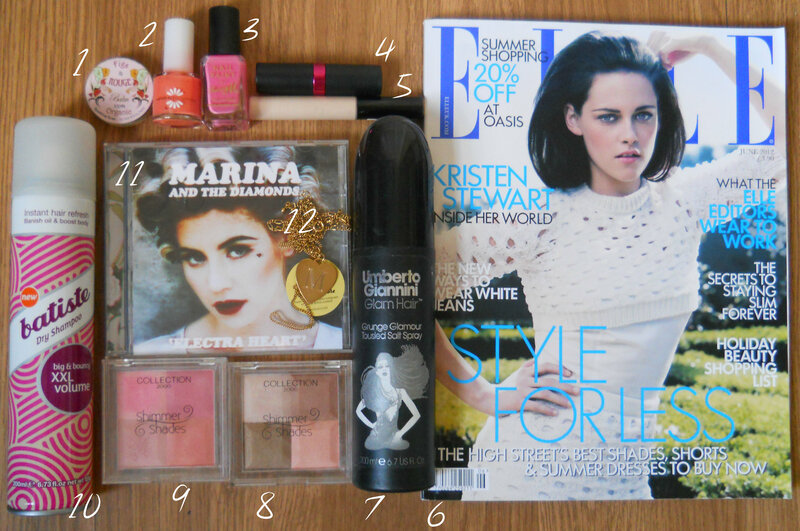 Number six is this month’s Elle with Kristen Stewart on the cover. This issue was hotly anticipated and I couldn’t get my hands on it fast enough. The vintage style shoot is gorgeous and of course, you’ve got to love K-Stew. I always get Elle, but this month’s issue in particular was a firm favourite. To see more Kristen Stewart style, click here to be taken to my Kristen Stewart Lookbook, or here to see a style off between her and fellow Snow White Lily Collins. In at number seven it’s Umberto Giannini’s Grunge Glamour Tousled Salt Spray. I bought this last year as my hair always looks amazing when I’ve been in the sea, so of course I wanted to replicate that look at home. It creates really natural waves and I really love the smell of this, it’s the epitome of summer to me now. I used it throughout the summer last year and have just rediscovered it amongst my hair products, and I’m loving it all over again. It’s around the £5 mark and available from Boots and Superdrug and it’s a lot cheaper than some of the higher end surf sprays out there such as the famous Bumble and Bumble one that is so coveted. I just take my hair in sections, spray this either onto the hair or into my hand and then scrunch my hair in my hands for loose tousled waves. Number eight is a product I picked up only a week ago, but am absolutely loving already, it’s Collection 2000’s Shimmer Shades palette in Way to Glow. I saw today that Louise of Sprinkle of Glitter also had this in her May Favourites as it’s just so handy and for under £5 really does a great job of highlighting and contouring. I needed a highlighter and the top left square is perfect for me, and the darker colours obviously are good contour shades too. I have nothing bad to say about this, especially for the price. 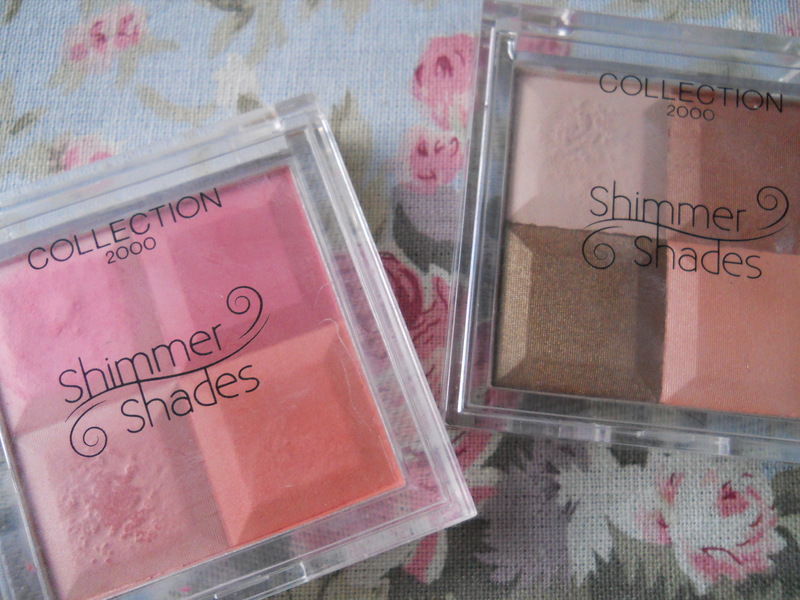 Number nine is another Collection 2000 Shimmer Shades palette and it’s the first one of the two that I bought (and the reason I felt so confident about buying the second). It’s the blush palette, aptly named Blushalicious, and I found out about this through Kate of Dolly Bow Bow who raved about it in a haul not long ago. Being as I wanted a peachy blush for summer I thought, why not pick this up as it has a lovely peach blush and three other shades in it, for under £5. Again, like the Way to Glow palette, it does the job, it’s affordable and accessible and I just don’t think you can go wrong with it. It’s the only blush palette I’ve been using at the moment. Utter swoon. Number ten was yet another impulse purchase from Boots, and it’s the Batiste Dry Shampoo Big & Bouncy XXL Volume, and I have found the ultimate dry shampoo. For me anyway. My hair only gets drier the longer I leave it unwashed, but the problem I have is limp, flat hair, so I use dry shampoo for volume at my roots and adding texture to my hair for styling. This is the oracle for me as it really lifts my roots and gives me volume as though I’ve spent ages backcombing. Being as I’m growing my hair, I want to use as little heat as possible on it, so this as part of my daily routine is an unskippable step; I leave my hair to air dry (when possible), spray this into my roots for lift and texture, and then apply my Umberto Giannini sea salt spray and I have gorgeous volume and waves without any heat. For under £4 I think it’s a great buy and the big bottle will definitely last me a while. Number eleven is an album that I was super excited to get my hands on, and it’s Marina and the Diamonds’ Electra Heart which came out at the end of April. It’s a fun slice of electro pop and there are plenty of catchy tunes you’ll be singing for weeks on here. Some of my favourites are Living Dead, Lies and Valley of the Dolls and of course the first single from the album, Primadonna. If you love sugary electro pop with some serious attitude then this will be right up your street. Marina is an idol of mine as much for her incredible style as that voice. Check out this acoustic version of album track, Lies, it is just utterly beautiful! To see more of Marina’s amazing style moments, click here to see my Marina Diamandis Style Inspiration post. 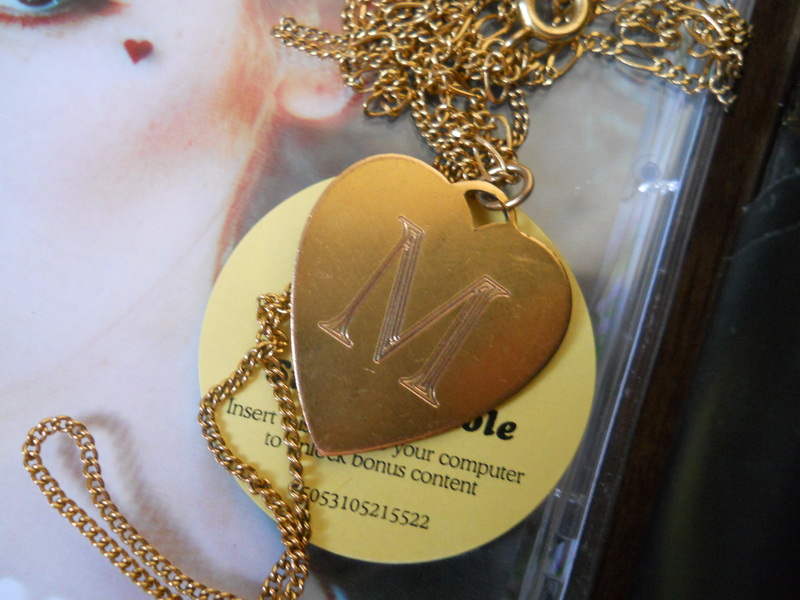 Finally, number twelve is a necklace I picked up last week in Urban Outfitters that I love so much. It’s a gold heart pendant with an initial on, with a super long chain and I think it’s a really cute addition to a long summer dress or romantic tops. I’ve also been wearing it with some grungy vests for a layered necklace look which I’m also a fan of. Annoyingly I paid £16 for this which I think is a little steep, but it’s just been reduced to £8 in the sale! It’s an extremely versatile piece and I’m looking forward to wearing it all year round and even doubling it over for a shorter necklace too. I wore this cutesy pendant in a recent OOTD so stay tuned for that post next week. Disclaimer (because you have to don’t you! ): All images were taken and are owned by me. All items were purchased with my own money and all opinions on products are my own. I am not affiliated with any brands mentioned and none of my links are affiliate links.